What is Express Service at Newton Nissan of Gallatin? Did you know that you do not need to make an appointment for an oil change at Newton Nissan? 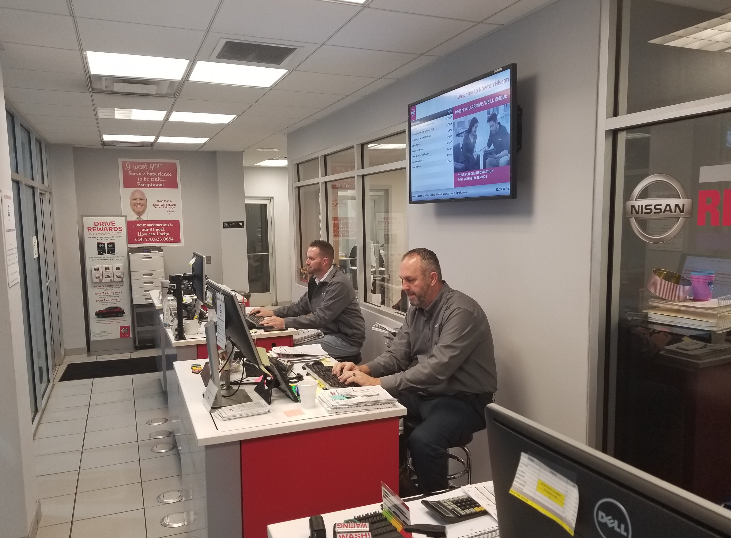 We know life gets busy and that your time is very valuable, so we want to help by offering an Express Service lane so that you can get in and out of the service drive as quickly as possible. You can come at your convenience, on your time. Simply pull into the left lane at our service center in Gallatin, TN. 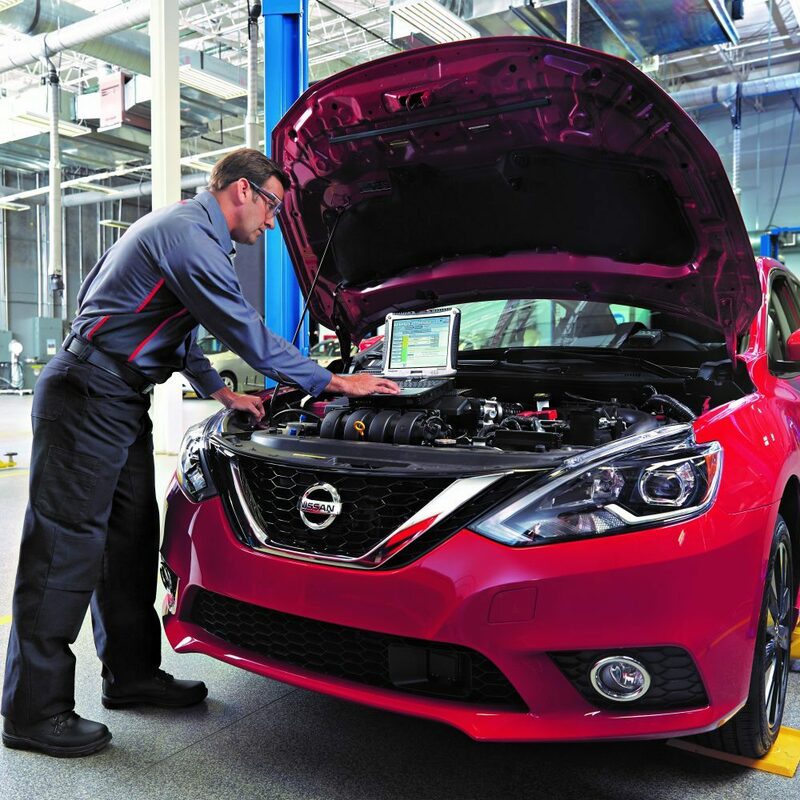 One of our Express Service advisers will welcome you, assess your vehicle’s needs, and our Nissan certified technicians will get to work on your vehicle! While you wait, enjoy free coffee, snacks, water, and Wi-Fi! We know there are a lot of options when considering a vehicle purchase. New, used, certified pre-owned–it can get a little confusing. For most people, the most important piece of the car-buying puzzle is price, right? You want to know you are getting the best deal. At Newton Nissan, we want you to get the best deal as well the best experience possible. However, there’s more than just price & experience involved in your deal. The vehicle itself must be in the best condition possible, especially used or pre-owned vehicles. Keep reading for more information on how we re-condition our Newton Certified Pre-Owned vehicles. What work goes into a Newton Certified Pre-O wned Vehicle? At Newton Nissan of Gallatin, we take pride in our used inventory. We don’t just give them a car wash, a once-over, and park them out front. We make sure they are thoroughly ready to go before you make your decision and drive off our lot! Let us help you find your next Newton Certified Pre-Owned vehicle today! **Please note: our cheaper, pre-auction line cars undergo an inspection to a lesser degree to keep them affordable for customers looking for a more inexpensive option. Pre-Auction Line vehicles, or “PAL” for short, are available to the public for a limited time before being released to independent dealerships. A free Carfax® report is still available for these vehicles. PAL vehicles fall outside of Newton Nissan’s traditional inventory offerings and are sold “as-is,” without a warranty. Pal Cars are priced more affordably and typically have higher mileage. 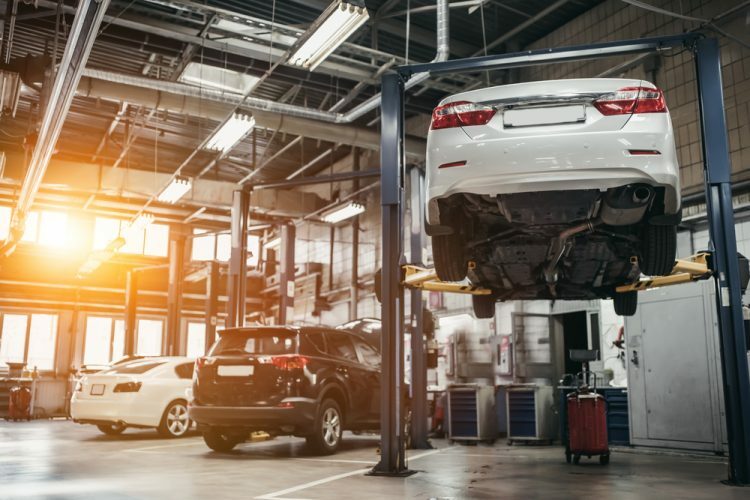 Additionally, during your time at the dealership, we will go over important notes about the vehicle’s condition and have you sign documents that state you understand that the vehicle is sold “as is,” meaning you take full responsibility for any service work that the vehicle may need because it has not been reconditioned like our other used vehicles have been. Have more questions about our Pre-Auction Line vehicles? One of our sales team would love to help you. You can chat with them below, call, or email. Please let us know how we can best serve you! We are here to give you the simplest & best car-buying experience in Middle Tennessee! 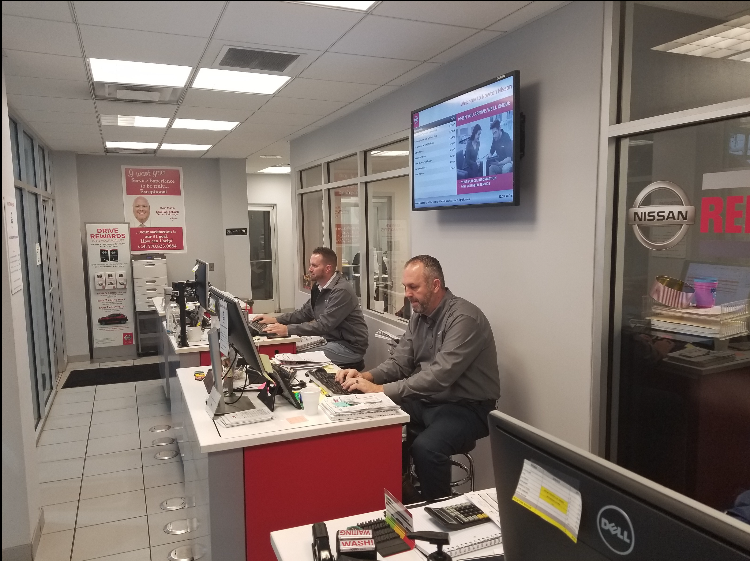 Starting in 2019, Newton Nissan launched the Newton Advantage, a new benefit of purchasing your new Nissan with us here in Gallatin, just a short drive north of Nashville. We offer this because we want to offer the best to our customers, who are more like family to us. 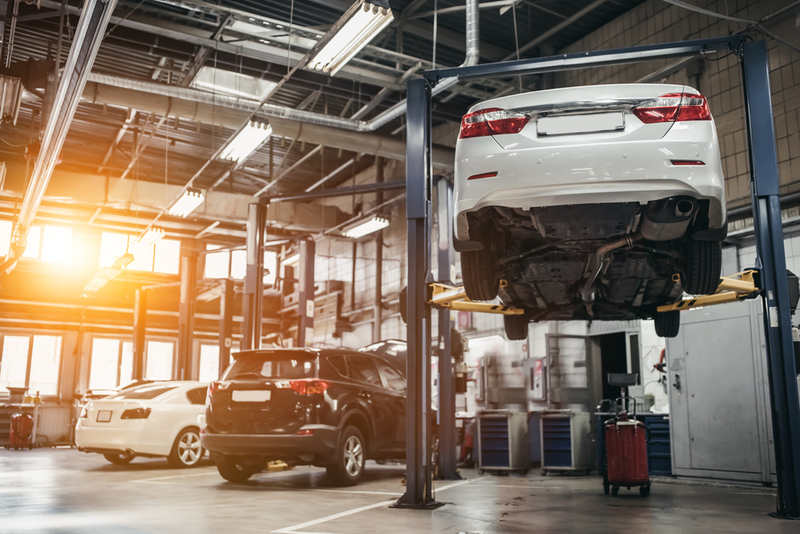 The Carefree Maintenance Plan requires that you get your oil changes & tire rotations here at our service center in Gallatin, which is only a short drive from Lebanon, Hendersonville, Madison, Goodlettsville, and downtown Nashville. You can trust our Nissan-certified technicians and enjoy free coffee, snacks, and WiFi while you wait. However, there is no requirement to get your car’s service for the Lifetime Warranty done here. You simply must follow the manufacturer’s recommended maintenance plan and keep all your records. Have you heard our latest radio commercial? In it, Mike Abbondanza mentioned a few things that you should never do, including: buying a car from any other place than Newton Nissan of Gallatin! Why? Because of the Newton Advantage. We’ve got you and your new Nissan vehicle covered with both a 2-year Carefree Maintenance Package and — brand new for 2019 — a Lifetime Powertrain Warranty! Combine that with our customer service and our goal to make your car-buying experience as simple & stress-free as possible, and that’s it: the Newton Advantage. for a chance to win a $10 Starbucks Gift Card! It’s no secret that we here at Newton Nissan love to give back. From giving away brand-new cars to smart students, hosting fun family events like Trunk or Treat, and sponsoring schools and sporting teams in our area–we are dedicated to supporting our community. One of the ways we’ve given back in recent years has been sponsoring an organization near and dear to our founder & owner’s hearts: Mustard Seed Communities. This non-profit has multiple residential homes in 5 countries, which care for neglected and abandoned children with very special medical needs. Each community cares for residents’ physical, mental, and spiritual needs for as long as needed. Bill and Terry Newton have been working with them for over 16 years now! 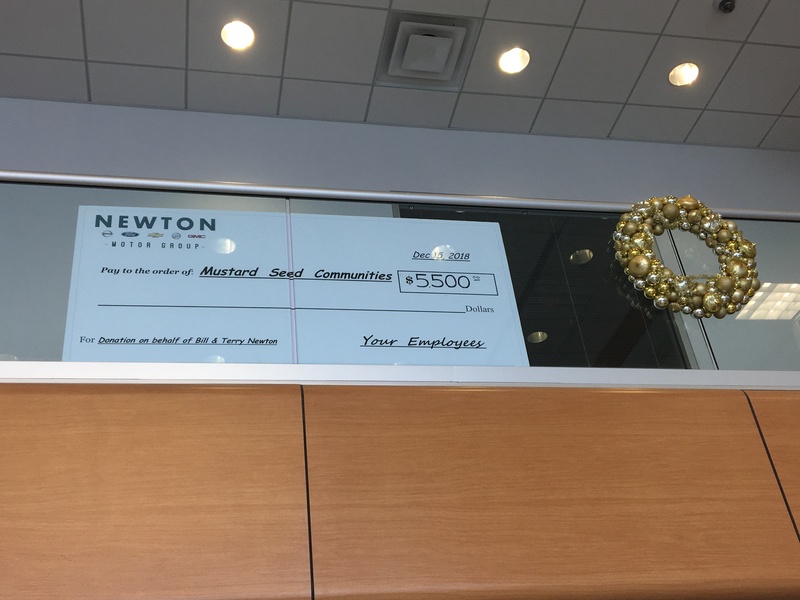 Each year, the way Newton gives back is to donate in honor of the Newtons. Each of us give what we can, and every employee is invited to participate. We then announce the donation at our annual staff Christmas party. This year, we raised the most that we’ve ever raised before! $5500 will be donated to Mustard Seed Communities to help them continue in their mission to help some of the most needy children around the world. We are grateful for the opportunity to participate in this mission alongside our owners. To learn more about Mustard Seed Communities and how you can help, please visit their website. ‘Tis the Season for Christmas Music! We’re excited about the launch of this all-new redesign of the classic Nissan sedan we know and love! From exterior, to the engine, to the interior–this Altima has you covered. To get you excited too (it’ll be here soon! ), we wanted to give you our top-five things you need to know about the 2019 Nissan Altima. This sixth-generation Altima now has a deeper Nissan-signature V-motion grille, a floating roof like others in the Nissan lineup, and sharper lines. In fact, the new Altima is 1.1 inches lower in height than previous models. It culminates to a very fresh makeover for one of the most well-known and well-loved Nissan models. The 2019 Nissan Altima is leading the way in its class with the addition of the available ProPilot Assist. This is available on the SV, SL, and Platinum trim levels. ProPilot Assist was included on 2018 models like the Rogue; read more about that feature here. Also available on these trims is the new Rear Automatic Braking (RAB). RAB helps the driver detect stationary objects when backing up, and, if necessary, will apply the break to avoid a collision. All of these combine to create a 360 safety shield around the 2019 Nissan Altima drivers and passengers, as Nissan continues to forge forward in vehicle safety technology. Concierge service – a free 3-year plan to order flowers, book a restaurant, reserve tickets, and more! Have questions or want to reserve your very own 2019 Nissan Altima today? Call us today at 615-432-4364! for more information, see Nissan's press release here. Here at Newton Nissan, we love our community. We take in many different sponsorship applications and try to be a part of as many fundraising events as we can. We can’t help everyone, but we can make a difference in little ways all across our community. So when we heard about this year’s White House on Fire “Rocktober Celebration,” benefiting the Volunteer Fire Department in White House, we knew we wanted to help. This event has turned from a small idea that Brian Gamboa had to help the Fire Department, to a community-wide event that many other local businesses have also sponsored to help raise money. Tickets are on sale now for White House On Fire! Online Presale Discount at only $5 each. VIP/Meet n Greet tickets are now available for $20 each. Kids 8 and under FREE of charge. Log on to www.bit.ly/whofrock to get tickets now. White House On Fire is an outdoor event in the heart of town, in the western quadrant of the Kroger parking lot, located at 520 Hwy 76, White House, TN 37188. Lawn chairs are welcomed. No coolers please. White House On Fire is on its way to becoming a firm fixture in the local community, centered a few songs north of Nashville and south of Bowling Green, KY, on I-­‐65 at exit 108. This year’s sponsors include Heritage Remodel, NashvilleWebDesign.BIZ, 31W Insulation, Music City Honda, White House Kroger, Bratten Electric, Wakefield Insurance, Dee Cee Vitamins, J and A Disposal and Southeast Electric with more details and information at WNRQ 105.9 The Rock radio. Other contributors include: Westside Rentals, White House Dairy Queen, Tavern 76 and Budweiser, Uptown Wine and Spirits, Los Jalapenos, Ink and Screens, Signature Signs and B and B Signs. Will you be coming to the event? Come find Newton Nissan – we’ll be there with a brand-new 2018 Nissan Titan!